It's he-e-r-e-! The all-new 2011 Dodge Charger, expectyed hitshowrooms late this year, has broken cover, and it looks like a new take on a familiar theme for the popular sports sedan: Sheer, raw performance in a larger package reacalling the glory days of muscle cars from Detroit. Dodge says the new Charger, a rear wheel drive sports sedan, traces its styling chops back to the second generation Charger from the late 1960s-- a fact that should come as no surprise since that generation was by far the most popular for Charger. "With its sinister “ready to attack the road” face, the all-new Dodge Charger puts the world’s best E-segment sedan competitors between its new “split crosshair” signature grille. Its sculpted all-new body is a conscious nod to its deep heritage and muscle-car roots," a Dodge news release says. " The Charger’s profile is also a modern affair, a result of countless hours in the wind tunnel, from its lower hood line, faster windshield and radically raked back headlights to its tighter wheel openings, lower sill and race-car-like flat underbody, the Charger effortlessly cuts thought the air with its attitude intact." The release says that the aluminum hood features "dual “scallops” that bring a sculptured, performance look to the front end, while large bodyside scallops deliver a striking undulating A-line across the doors. Running front to rear is the iconic horizontal “coke bottle” or “double-diamond” bodyside styling that creates a tapering silhouette accented with muscular front and rear fenders and gives the Dodge Charger one of the most distinct profiles on the road. Defining the fastback’s wide stance is an all-new signature taillamp design that incorporates 164 illuminating LEDs to form its signature “racetrack” graphic and gives the new Charger its unmistakable character from blocks away." Like all Mopar products this year, the Dodge Charger's interior has gotten a good going-over, and you can epect quite a bit more quaiity and good taste from teh new model compared to prior ones. The 2011 Dodge Charger gets a new thick-rimmed three-spoke Dodge steering wheel for enhanced performance feel and grip, and there are four different interior color combinations that you can order. The all-new 2011 Dodge Charger comes with Uconnect® Touch that integrates infotainment and convenience technologies, and the car also has Garmin® navigation, dual-zone climate controls and the ability to check fuel prices with the integration of available SIRIUS Travel Link. Big emphasis also was placed on reducing noise, and the company's engineers worked hard to isolate powertrain, road and wind noise. Structural design improvements include dual-pane acoustic windshield and front-door side glass, body-cavity silencing foam, under-flush roll-framed doors with triple seals and acoustic wheel-well liners to absorb road noise and quiet the cabin. The 2011 Charger SE and Charger Rallye feature the new 3.6-liter Pentastar engine, and if you spring for it, you will also be able to order the new Dodge Charger R/T which features the legendary 5.7-liter HEMI® V-8 engine with four-cylinder mode FuelSaver technology. You can also get a Charger R/T with all-wheel-drive (AWD) which features "a re-thought stance and 19-inch wheels to make it much more appealing than ever before," the Dodge news releae says." 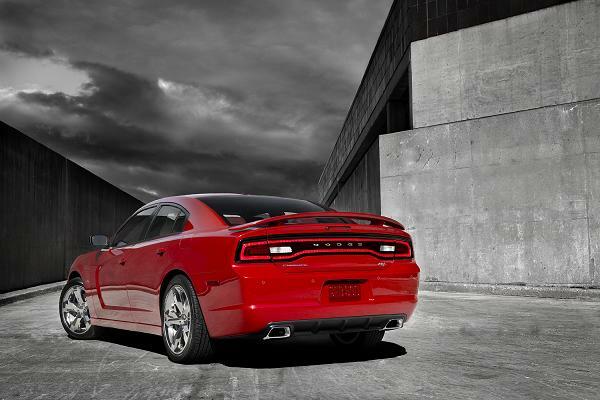 The AWD preserves the Charger's character and deepens its performance envelope in the most treacherous conditions. The Charger AWD features a segment-exclusive active transfer case and front-axle disconnect system to improve fuel economy by up to 5 percent. No other major automotive manufacturer offers the combination of these two independent technologies." 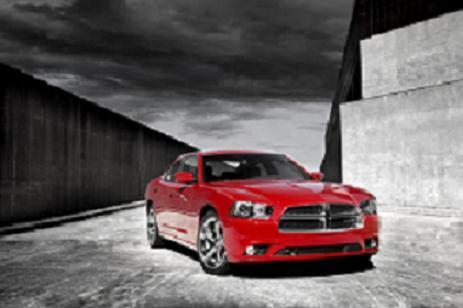 It adds, "Dodge Charger’s innovative AWD system seamlessly transitions between RWD and AWD with no driver intervention. When all-wheel drive is not required, the system automatically disconnects the front axle to maximize fuel economy while still providing the outstanding performance and handling inherent in rear-wheel- drive vehicles. The car also will have more than 65 safety and security features, including standard Keyless Enter-N-Go and electronic stability control (ESC) with segment-exclusive Ready Alert Braking and Rainy Day Brake Support safety features to improve overall vehicle handling and performance both on and off the track. Safety and security features available for the first time on the Dodge Charger include adaptive-cruise control (ACC) with Forward Collision Warning (FCW), Blind-spot Monitoring (BSM) with Rear Cross Path (RCP) detection and ParkView® rear back-up camera with grid lines. No information on pricing is available yet. We expect replacements for Chrysler 300 later this year, with some reports that as early as late November, we will finally see it in the flesh. In the meantime, information is beginning to be released about other important members of the Chryslerfamily. First up is the 2011 Chrysler Town & Country minivan, which enjoys major remodeling and a pretty big upgrade in materials and equipment all around. This minivan now is truly a luxury product, no apologies necessary. For one thing, there are lots more features on the new 2011 model. For instance, the Town & Country will offer a package of safety goodies called "SafetyTec." It includes 40 standard safety and technology features, including Blind-spot Monitoring and Rear Cross Path detection, which are only available on Chrysler Group minivans. Chrysler also is making upgrades to some of the exclusive features that have drawn a lot of interst from consumers.l. These include the Stow ‘n Go seating and storage system which gets some nicely upgraded, mnore omfortable seating, and a one-touch fold down feature for easier access to the third row. 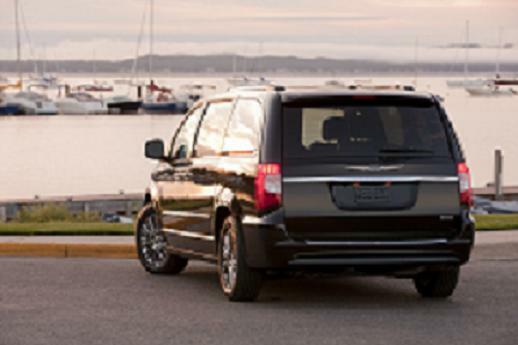 A Chrysler news release says the 2011 Town & Country gets a " new ‘super’ center console and technology that helps manage the rigors of family life." Of course, in order to keep up in this market, you need lots of high tech features, and Chrysler apparently is taking graet pains to make sure its products have the latest. These include a dual DVD system that can play different media at the same time, SIRIUS Backseat TV™ which offers three channels of children’s programming and FLO TV featuring 20 channels of live programming – both of which are exclusive to Chrysler Group minivans; voice command functions for radio, iPod/mp3 players, phone, navigation and information and the SafetyTec bundle of standard safety features, keeps families safe, connected and entertained. Powertrain improvements to the new 2011 Chrysler Town & Country offer more horsepower and torque without sacrificing fuel economy. The new 2011 Chrysler Town & Country is powered by the new Pentastar V-6 enginem, the company says, with a six-speed automatic transmission. The engine puts out 283 horsepower and 260 lb.-ft. of torque while still achieving an estimated EPA fuel economy rating of 17 miles per gallon (mpg) city and 25 mpg highway (compared with the previous 3.8-liter and 3.3-liter V-6 engines, which produced 197 hp and 230 lb.-ft. of torque and 175 hp and 205 lb.-ft. of torque respectively). Improvements to the driving dynamics, a new fuel economizer mode that helps maximize fuel economy and reductions in noise, vibration and harshness gives drivers a spirited driving experience that doesn’t hurt the wallet. Interior design has been something of a challenge in recent years for Chrysler on some of its products, but the Town & Country steps up to the plate on that score. Updates include a new instrument panel and instrument cluster; new Chrysler Brand steering wheel with integrated controls that allow the driver to operate the radio, cruise control, handsfree phone and other vehicle functions while keeping their hands on the wheel; upgraded cloth and leather seating materials; new “soft touch” door trim and new heating and cooling control system. Pricing information is not yet available. 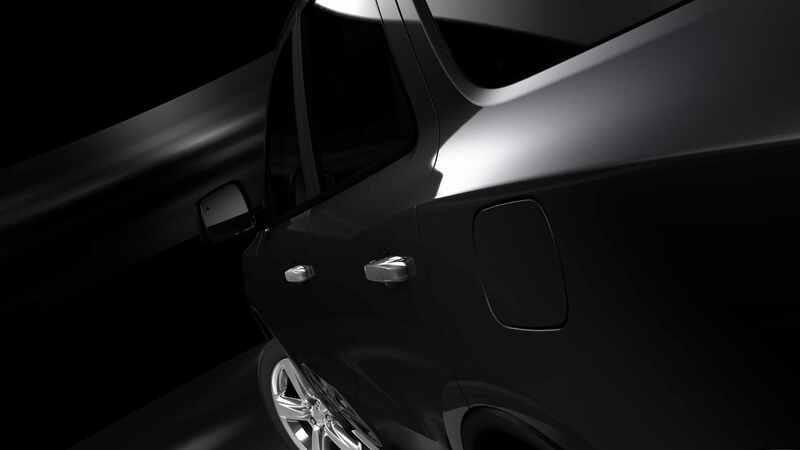 We also have some teaser pictures of the all-new 2012 Dodge Durango coming up soon. 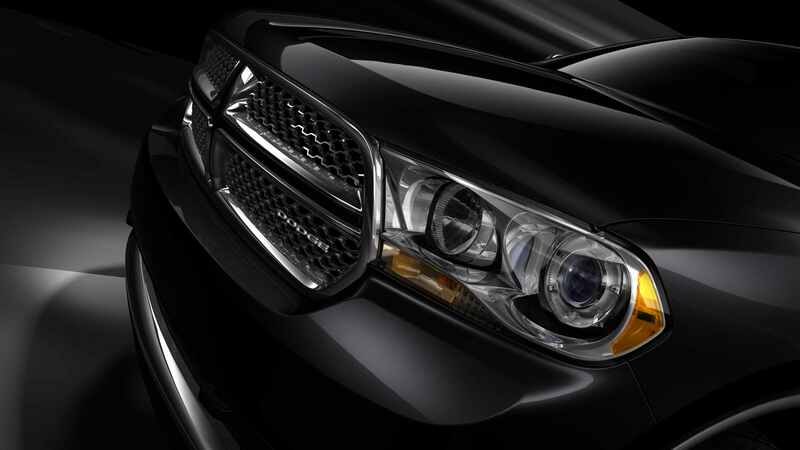 These appeared on the Chrysler media website, and show a dramatically restyled three row, SUV. It will be interesting to see if the Durango, when it’s introduced, can hold its own in a field in which crossovers--car based products--clearly have the upper hand. You should check out our story in this section on the 2011 Jeep Grand Cherokee, a landmark product that shows Chrysler is definitely headed in the right direction for its model lines, as well as the all-new Fiat 500.